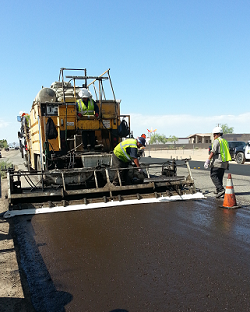 Pavement Preservation is a cost-effective way to maintain our roads. 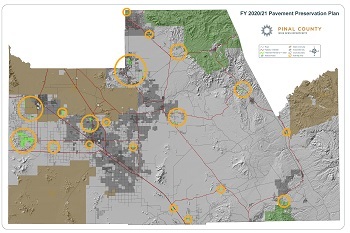 This program is designed to take direction through funding allocation from Pinal County and the Board of Supervisors. Such a program can vary annually depending on funding available. 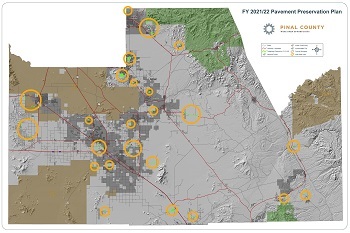 The overall goal is to have a long-term strategy that enhances pavement performance by having cost-effective practices and treatments to extend pavement life, improve safety and satisfy the needs of our motorists. 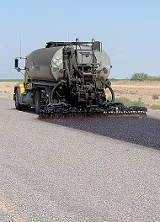 Chip Seal - a preventive maintenance surface treatment entailing a single application of asphalt emulsion by a distributor followed by a cover aggregate applied by a chip spreader. The surface is then rolled to seat the aggregate. 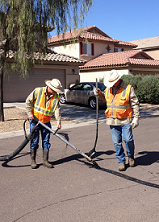 Crack Seal - a preventive technique in which a crack is prepared cleaned, dried and a high quality sealant material is placed into cracks to prevent infiltration of water into the underlying pavement layers. Fog Seal - a light application of diluted emulsion sprayed on an existing asphalt surface to enrich aging, weathered surfaces. Fog seals are also used to reduce chip loss on chip seals. Slurry Seal - a preventive or corrective maintenance surface treatment composed of a mixture of aggregate, emulsified asphalt, mineral filler, additives and water. 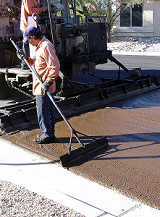 The slurry seal improves road surface texture and seals and protects the pavement. 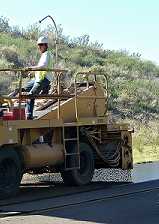 Microsurfacing - a skid resistant surface treat-ment composed of a mixture of polymer modi-fied asphalt emulsion, well graded aggregate, mineral filler, water and other additives. Microsurfacing cures more quickly than slurry seal allowing for a thicker application. may vary depending on funding available. *All listings may be subject to change due to unforeseen operational factors or barring weather. Information provided on these maps are intended for informational purposes only and may be subject to change without notice.